Our basic brewing kit will get you set up with the tools you need to break into the world of brewing! 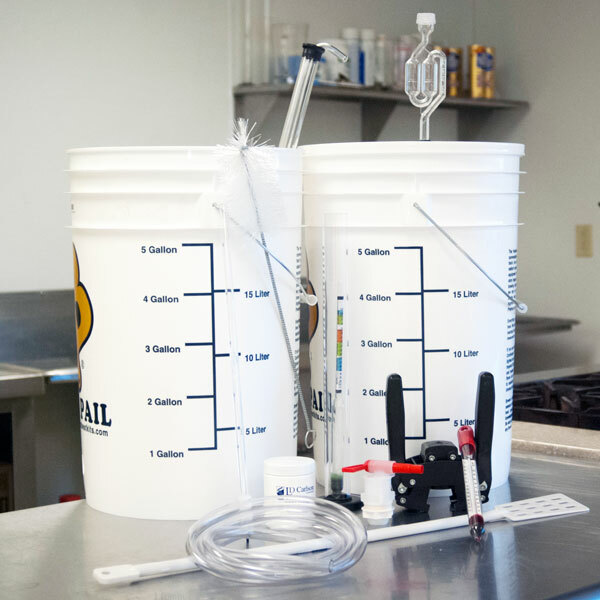 An economical way to get started, the basic brewing starter kit comes with the equipment you need to conduct a single stage fermentation of beer, then bottle off and cap the beer for the enjoyment of your family and friends! In addition, this kit comes with the tools you will need to take sugar readings and monitor your fermentation so that you know when the beer is done fermenting and can calculate the alcohol content of your brew. See what all the buzz is about (literally) and get into making your own beer at home with our basic brewing starter kit; the most complete starter kit for under $100 on the market! In addition to all the great equipment, we've made things easier for you and personally selected four beer kits to choose from for your first batch. They're great tasting AND easy to brew! American Wheat: A dry, crisp, and slightly tart American wheat beer that would appeal to both craft and mass beer drinkers. PDG Pale Ale: Like it hoppy? Then our PDG Pale Ale (that's short for Pretty Darn Good) is sure to be a hit with hop heads. Loaded with Northwest style hops, and low enough in alcohol that you can have more than one! Classic Dry Stout: Dark, roasty, and creamy! Our Guinness Stout clone is one of our most popular kits, and is a great starting ingredient kit for those wanting to brew something a bit darker. Dred Brown Porter: A dark, malty brown ale with caramel and chocolate notes that is nicely balanced. Brew Pot (this is needed on brew day). You can use a stock pot from home. We recommend at least a 5 Gallon Pot. A heat source. This could be as simple as your stovetop and as awesome as a propane gas outdoor burner. If using your stovetop, natural gas is the preferred option, but an electric stovetop will work. Roughly 48 pry off, 12oz. beer bottles.